Region: This earwig is found in the eastern portion of North America with similar species throughout North America. Life cycle: This insect produces one to two generations each year and hibernates as an egg. Physical Description: This 3/4 inch long earwig is reddish brown with short, leathery fore wings that are not that efficient for flight. It has a straight and thin body with pincers on the top of the abdomen. Although these pincers are fierce looking, they can do no harm to humans. The round eggs are white and are laid in the soil. 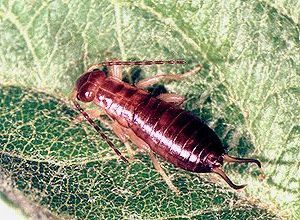 Feeding characteristics: The Earwig can be both beneficial and detrimental to your organic gardening crops. They act as scavengers on decaying matter and predators of insect larvae, snails, and other slow moving Bugs. They feed at night and spend the day under bark, stones, and garden debris. They will also feed on foliage of many garden plants, flowers, and trees, including dahlias, zinnias, butterfly bush, hollyhock, lettuce, strawberry, apricot, celery, potatoes, and seedling beans, and beets. They damage sweet corn by feeding on the stalks. The nymphs eat the plant shoots and eat holes in foliage and flowers. They may even infest ripening fruits, but damage is usually tolerable. Controls: The European Earwig is primarily spread by man, in bundles of plants and cut flowers. The earwig itself is a very poor flyer and cannot travel very far at all. Earwigs fall prey to the parasitic Tachinid flies, which was brought to this country from Europe. Chickens are also predators of the earwig. Earwigs fall for traps such as bamboo sections set horizontally throughout the garden or flowerbed. Check the traps early each morning and dispose of the earwigs in a bucket of water. Dispose in the compost pile. Alternatively, crumble up, mold a piece of paper into an upside down flowerpot, and set it up on a stake. For significant infestations, you can use florescent light-bulbs (low heat) hung low to the ground to attract them at night. This will attract the earwigs to the light and then you can use an organic pesticide to kill. This control is very effective but takes more effort and materials. After a week of this approach, you will significantly decimate the Earwig population in that area.